Story added: 08 Aug 2006 21:01. Last updated: 30 Aug 2006 12:37. 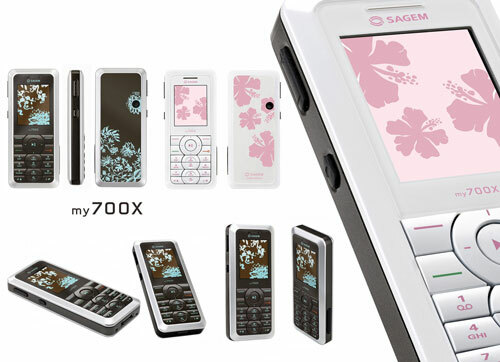 Sagem might not be the first name you think of when it comes to mobile phones, but the company is hoping that its new my700X handset is about to change all this. So does it? We take a closer look. The candy bar design is simple from its outset. There are no hidden buttons, no dual branding and no impression that this is anything more than a phone. Of course as with all mobiles launched today, the phone does sport a digital camera - in this case a 1.3 megapixel one - however the casing doesn't sell this in anyway apart from a dark circle. Claiming it's an understatement is an overstatement. That styling is reminiscent of a Nokia of days gone by, however the phone's front fails to ignite any sense of oh's and ah's as we're sure Sagem wanted. The 262k 176 x 220 pixel screen looks small, even though it's only slightly smaller than the Samsung D600 and the keys are very plastic to touch and although this comes in a variation of colours the white (which we reviewed) just doesn't do it for us. Even Mrs Pocket-lint, whom the phone is clearly geared towards, said that it wasn't anything special, however she did like the flowery pattern on the back. Get past the design and the phone offers all the usual features we've come to expect from a multimedia extravaganza. FM Radio, MP3 player, digital camera, Bluetooth and quad band connectivity, suggesting that the my700X is no slouch. One feature we did like was the instant prompt after each phone call to save the number into your address book meaning that with a quick press of a few buttons you've built your contacts list into something rather impressive. However although the phone features small gems, its not enough to impress us overall. While the Sagem features everything that you want it to, it just doesn't come with that edge that perhaps other manufacturers such as Nokia, Sony Ericsson, Samsung, Motorola and LG bring to their handsets and so you are left with something that is an also ran rather than a contender. It's a shame, but this is one French product that doesn't have that Va Va Voom.